Try to login Qnap ->No? Check document about other Qnap errors. 3 – At Admin page, go Disk Managment -> ISCSI and check if “Enable ISCSI Target Service” option is Enable under Portal managment. ->No? Activate option and click Apply. At 1.st example named “Test”, see that left “plus” seems grey, and it means you have target but no Lun. You may accidently delete lun, so login with winscp and check if your luns are under . @iscsi.img folder or not. if they exist, try my iscsi lun recovery document to fix the problem, or request help from Qnap support Taiwan. 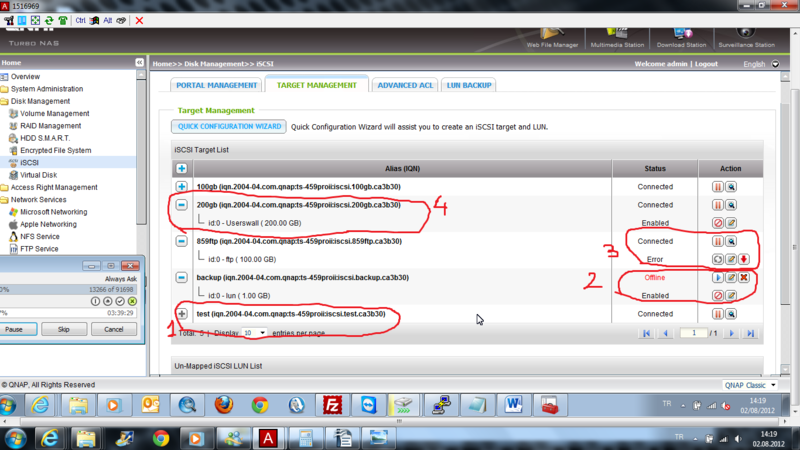 At 2.th example named backup, ISCSI target seems stopped and just start it back by pressing blue icon. if if doesnt work, login with winscp and check if your luns are under . @iscsi.img folder or not. if they exist, try my iscsi lun recovery document to fix the problem, or request help from Qnap support Taiwan. At 3.th example named 859ftp, ISCSI lun gives error, because its not there anymore, so connect with winscp and check if its still under . 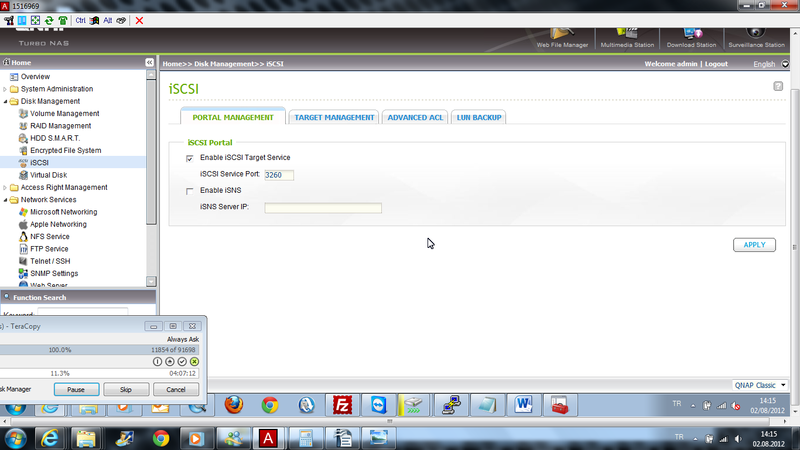 @iscsi.img or not. check my “iscsi lund doesnt exist under “. @iscsi.img” document. At 4.th example named 200gb, everything seems perfect on Qnap. Try to Restart Qnap and reconnect via ISCSI initiator on windows if problem fixed or not. If problem still exist, check your RAID system if its allright. Sometimes you must fix your RAID from “in degreed mode” to reach your ISCSI back. If problem exist, check my ISCSI lun recovery document or request help from Qnap Taiwan. If problem still exist, please request help from Qnap Taiwan.